One of my favorite horses, Purita. She has a long stride for a polo pony but she is very comfortable to ride and just beautiful. 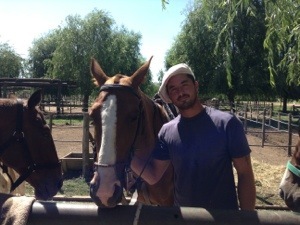 Here with Matias, one of the petizeros (grooms.) There are about 45 horses that belong to Puesto Viejo and are used for polo guests and trail rides, plus something like 150 other horses belonging to the club members. Image | This entry was posted in Campo, Polo. Bookmark the permalink.